Perth-based Bus and Coach International’s new Chinese baby was ‘born’ in Xiamen, southern China this week after just six months from planting the seed to delivering the fledgling factory. And like any new father, BCI Chairman Ron Nazzari was pleased as punch with how the Xiamen Fengtai Bus and Coach International (FTBCI) factory was launched with much local fanfare. were on hand to watch the proceedings, and – according to Nazzari – the reaction from these operators was overwhelmingly positive. "Our customers have all said to us they can’t believe what we’ve done," Nazzari says. "A lot of people here today have been to Nanchang and a fair few have been to Wuxi to see the three stages of our movements – they’ve seen us grow." The joint partnership with Fengtai has acquired 100,000 square metres within Xiamen’s duty free zone in southern China, just a few kilometres from the shipping terminal. The partners have built on 48,000 square metres with room to grow over the next twelve months. "We’ve got more ability now to build much bigger than we are," says Nazzari. 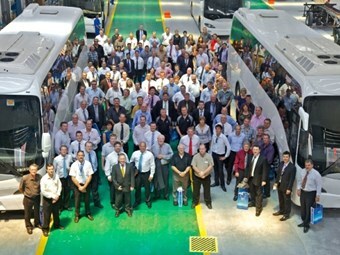 Some Australian and New Zealand operators expressed surprise with the speed the factory was constructed between November 2010 and February 2011. BCI’s production has admittedly decreased over the past few months while the new site is fully commissioned. "We are making sure all parts of the factory are in order so that no-one loses money," Nazzari says. "As far as production goes, we are at about 35 percent of our staff’s capacity." Nazzari expects the financial return from the investment should start to be felt by July. "We have good orders, but we’ve got a company that costs nearly AUD$800,000 a month to run, and with no income for five months it hurt us." More than one operator commented their interest in seeing how the factory will grow and develop over its first year. "In twelve months we will be much bigger than we are today," Nazzari says. The Xiamen facility has capacity for over 100 buses in build at a time. The big head-turner at the opening, after the debris from the confetti-cannon had cleared, was the collection of fully electric FTBCI buses parked in the forecourt, and prepared for operators to ‘take them for a spin’. "Our future is to sell electric-hybrid technology," Nazzari says. Right now Nazzari is looking at new axle drive technology which would require a further $20 million investment. "If you are good at the electric vehicle side it’s your future." in the FTBCI electric low floors, with an all-electric unit about to leave Xiamen for Australia. At this stage the client and the nature of the vehicle’s use remains confidential. "We’ve talked about a lease arrangement (with the customer)," says Nazzari. All up the FTBCI factory launch this week in Xiamen was a big event, unlike anything you would likely see for a factory opening across any industrial sector in Australian or New Zealand. * For more on the FTBCI factory, and the Nazzari business strategy leading to the new Xiamen facility, including operator reaction, a full report will feature in the June 2011 issue of ABC magazine.